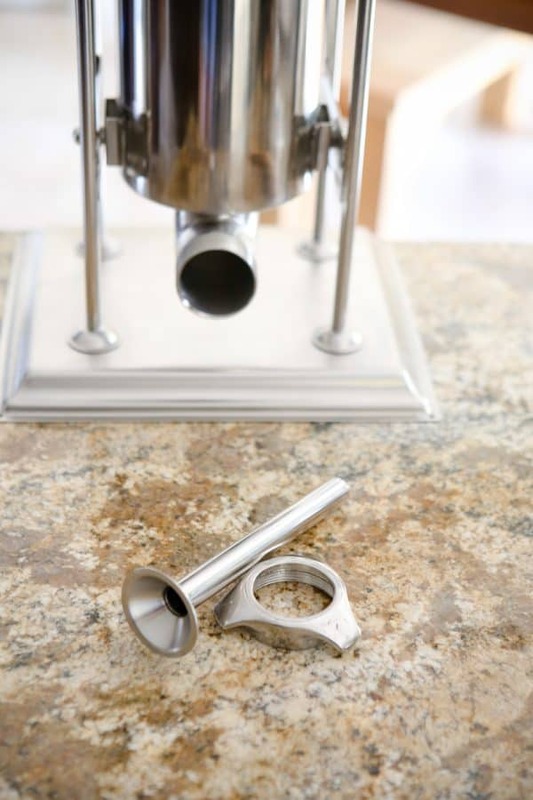 Hover on the image below to shop for the Big Bite® Sausage Stuffer! Growing up in the rural parts of Florida, I learned to love the land, and all it provides. My grandfather is a hunter, having learned from his father and so on. He loves the outdoors and loves to spend time in nature while hunting and fishing. The best part about his hunting trips, is that he’ll bring us fresh meat. And in Florida we not only have tasty deer, turkey and quail, but lots of gator and wild boar too! Our gator population is very high, so when it’s hunting season, he’ll get at least one for that prized tail meat. The boar population in Florida is very high too, it’s actually becoming a problem. Boar can be very aggressive, and there’s so many of them, they’re coming in neighborhoods and becoming a nuisance. They tear up native lands and habitats too. We even see them on the banks of the river during the day when we go fishing. They don’t seem afraid of humans at all. I could go on and on about how destructive they are. But rather than complaining about those annoying boar, I’ll just give you a tasty recipe for them. Boar is a very lean, flavorful type of pork. Feral pigs run around all day, eating all the tasty things in the woods they can find, so their meat is also really flavorful. 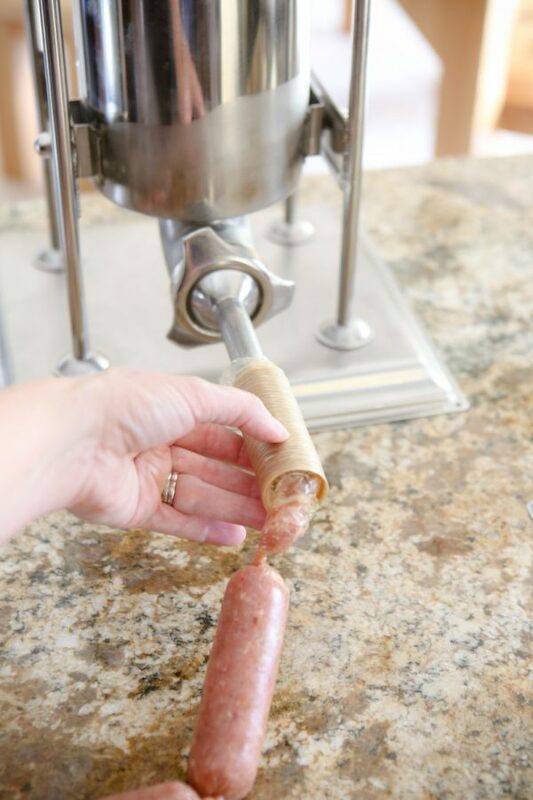 To make this sausage, I’m using a Big Bite® Dual Gear Stuffer – 10 LB. SS Vertical with 2 Speeds from LEM™ Products. 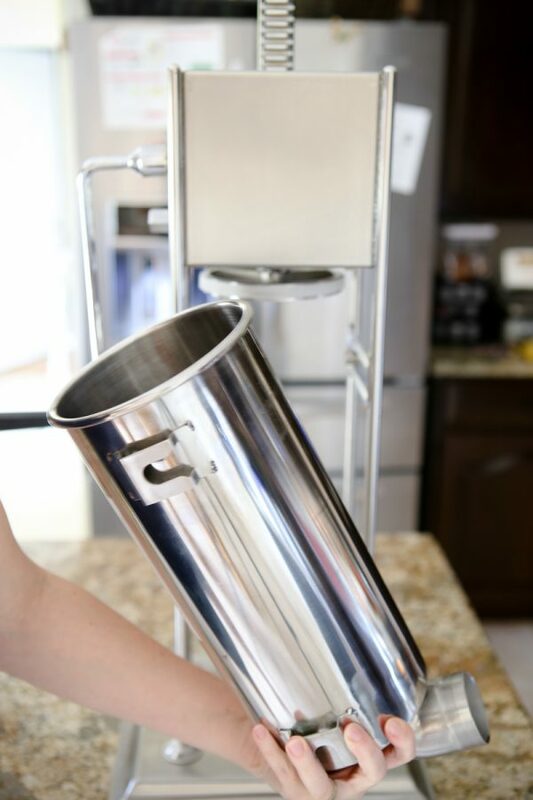 This Big Bite® Sausage Stuffer makes easy work out of processing large batches of meat. You can add 10 lbs of meat to this stuffer at a time to make sausages, and with 2 speeds, making sausage just got a whole lot easier. 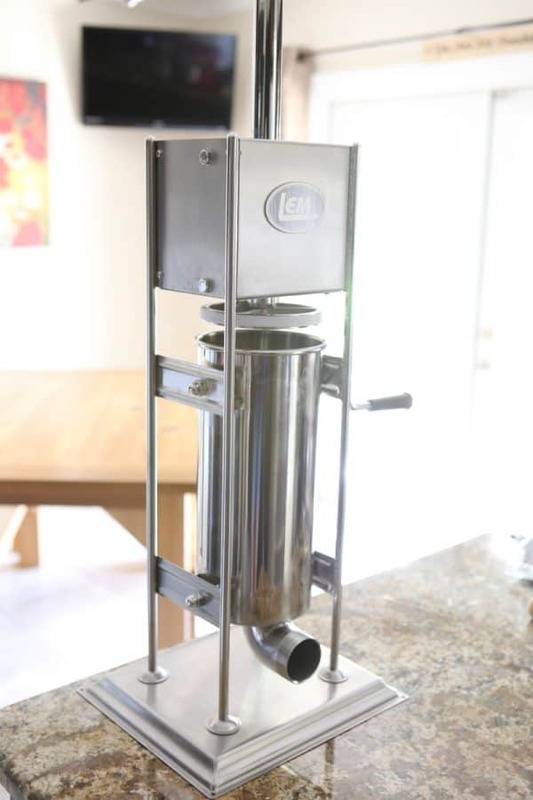 LEM™ Products also has a The Big Bite® Grinder to make all the ground meat you need, the Big Bite® Sausage Stuffer shown here, Dehydrators for that jerky everyone loves, and Vacuum Sealers to help preserve the bounty. 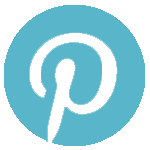 They also have lots of accessories, spice blends and plenty of helpful tutorial type videos too for using their products. 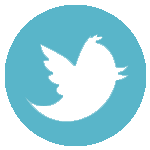 You can find and shop for all their products on their website here. That’s where I got this Big Bite® Dual Gear Stuffer. 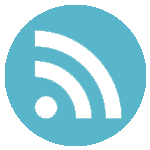 Their website is so easy to use! 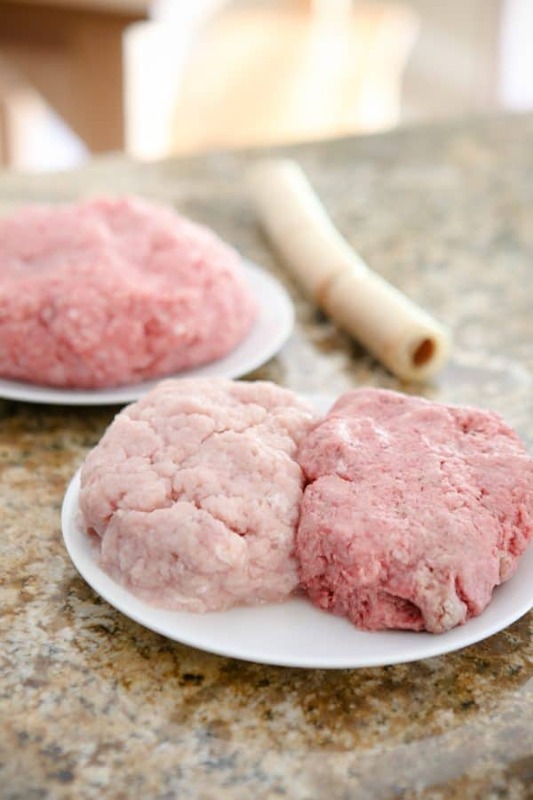 You can find all the things that you need to process your own meat at home. 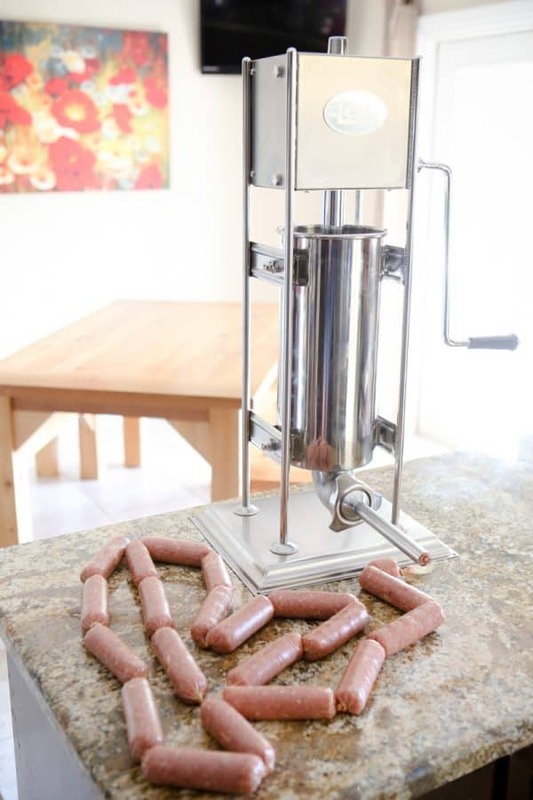 I was able to shop for this Big Bite® Sausage Stuffer and all the accessories needed to make this homemade sausage there. 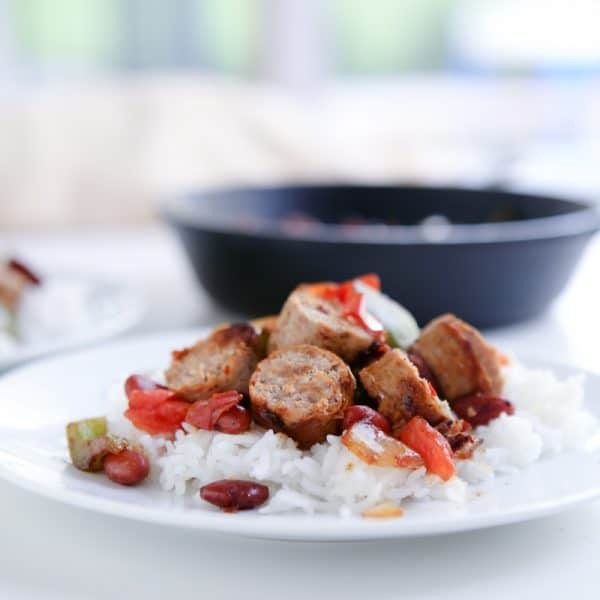 For this recipe I’ve combined flavorful ground boar, ground pork, and gator meat to make this unique sausage. 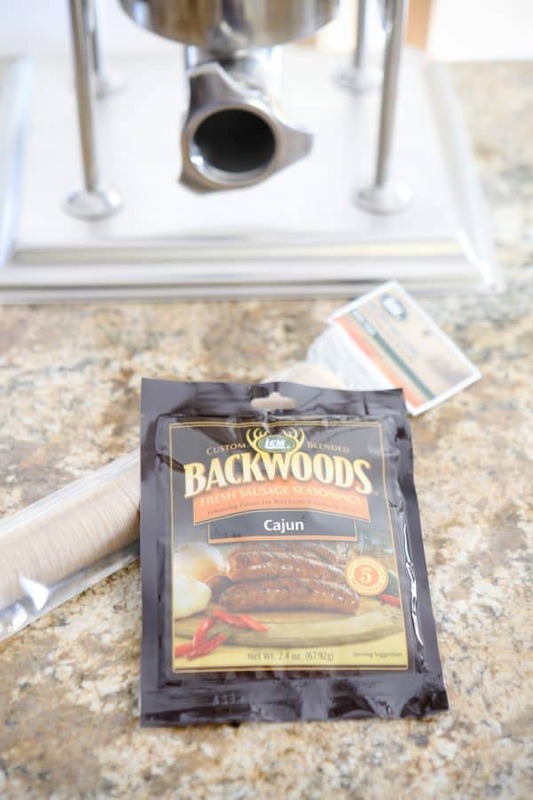 Then I’ve added the Backwoods Cajun Fresh Sausage Seasoning. These packets are designed for 5 lb batches of meat. I mixed the seasonings along with water in a large bowl. I just work it with y hands until it’s all together. 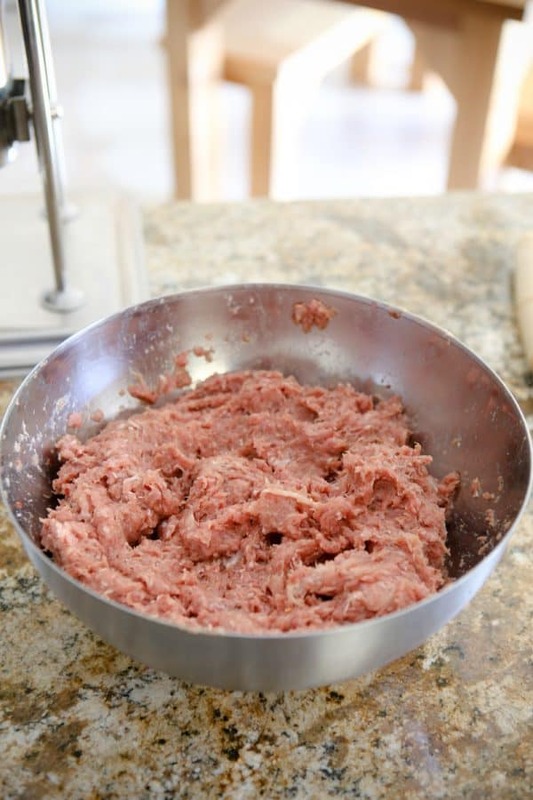 Don’t forget to add water to your ground meat. It makes working with the sausage much easier. Next I put it in the Big Bite® Dual Gear Stuffer. 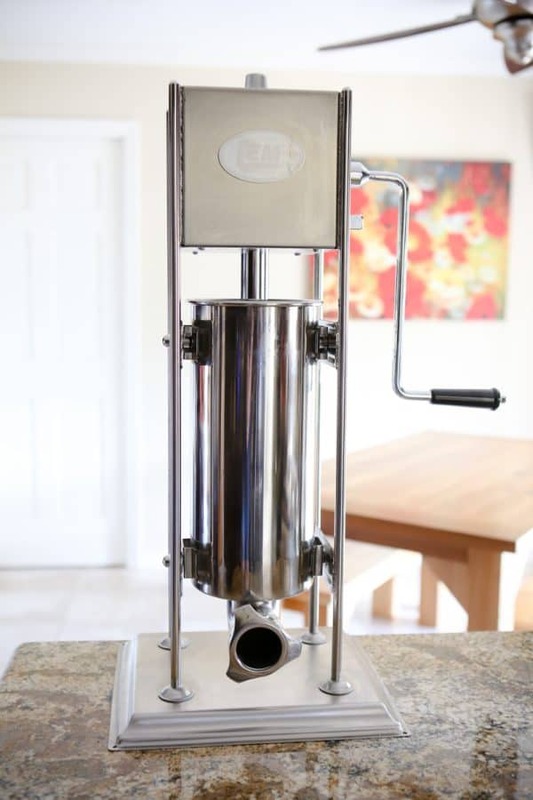 This is one serious sausage stuffer. It’s all stainless steel, always very durable and did I mention it was heavy? You don’t have to worry about this baby toppling over. 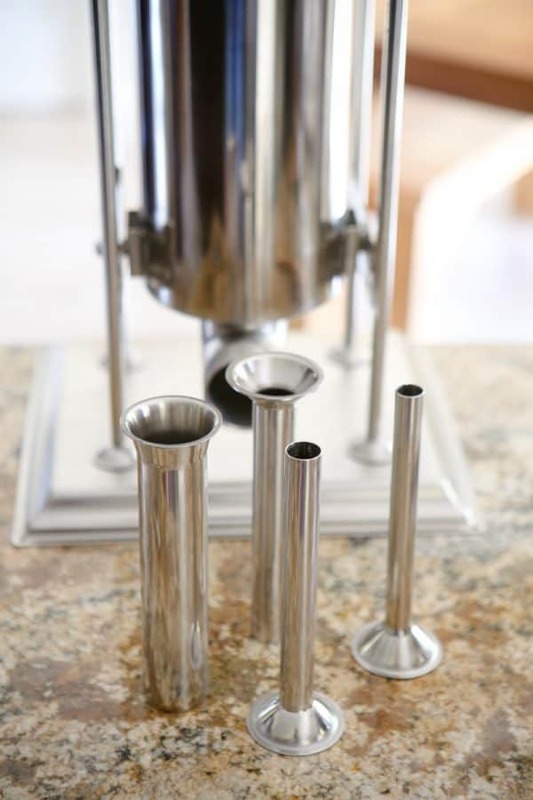 It comes with four sizes of sausage stuffers for any type of sausage you might want to make to make. For this recipe though, we’re using the 3/4 nozzle. The next thing I do is raise the stuffer by cranking the handle. 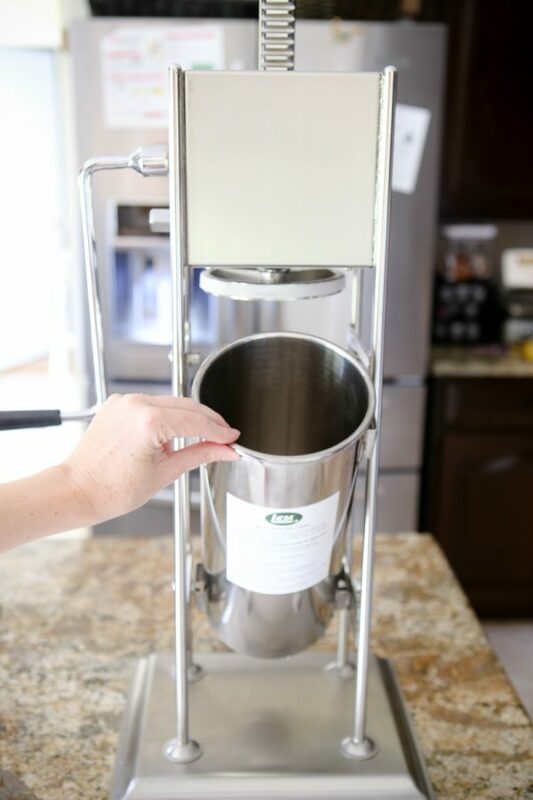 This stuffer has two speeds, one slow for stuffing, and one fast speed for raising the stuffer so you can refill or clean it quickly. Be sure to also get a large cookie sheet or sanitize your work surface because there’s going to be a whole lotta sausage real soon! Then I go to the back of the machine and tilt back the container for the sausage. 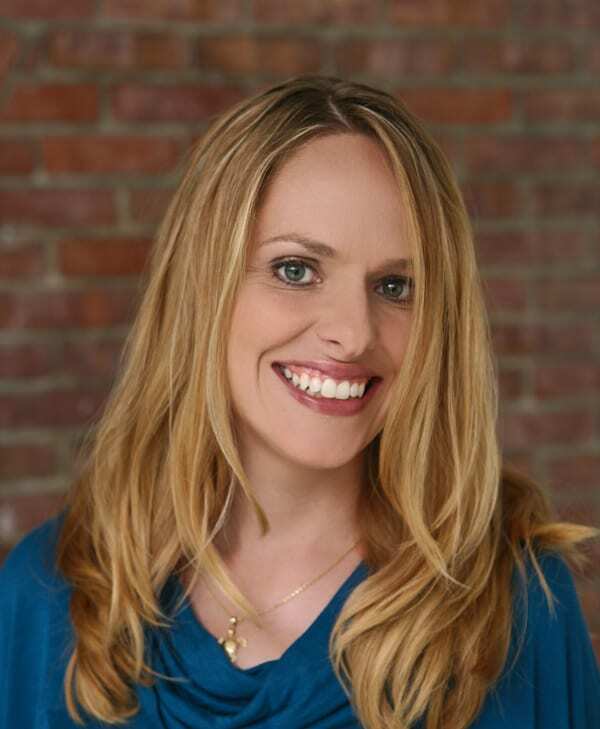 Then I just keep tilting it down and remove it like so. That way I can fill the container with my sausage meat easier. After it’s filled and placed back together, the next step is to attach the nozzle and place the sausage casing on the machine. Now slowly let’s start making some sausage! You just fill each link, and then twist to make the next sausage. 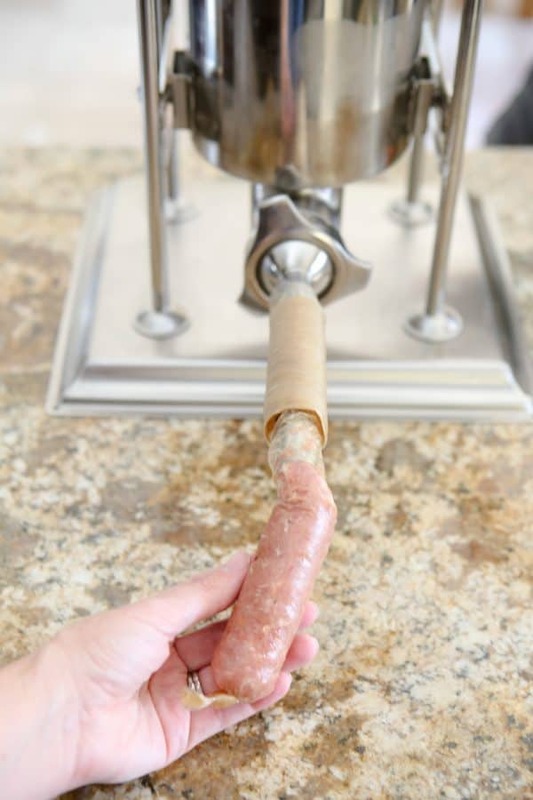 I found that twisting the casing on the nozzle, instead of the actual sausage itself made things a little easier. This part goes faster than you think, and before you know it you’re whole counters are covered in delectable, delicious homemade sausage! 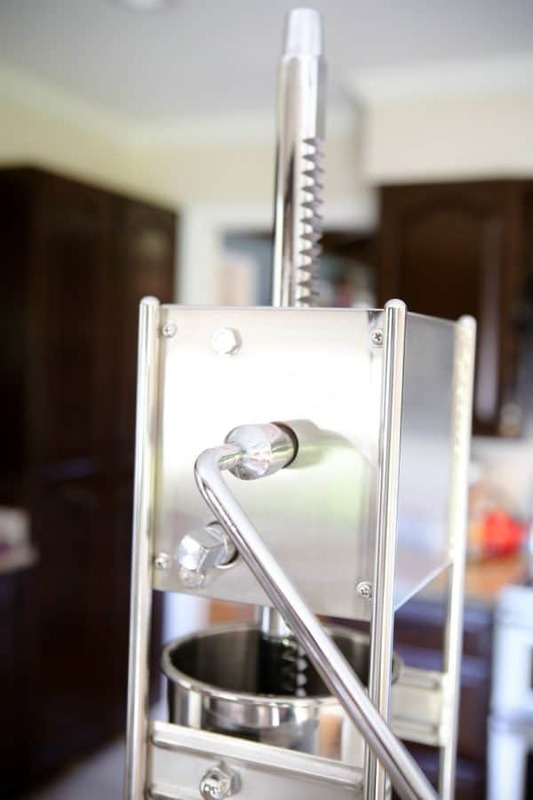 This Big Bite® Dual Gear Stuffer can make how you process meat so much easier. 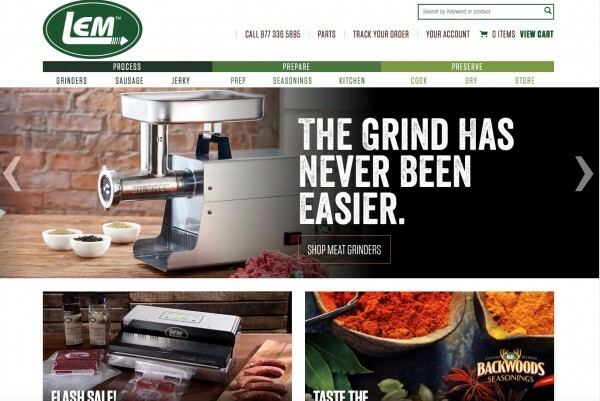 It saves time and money and you’ll be making your very own sausage, with the meat you or your loved one has hunted. It’s a great investment and will make your “field to table” dishes that much easier to achieve. 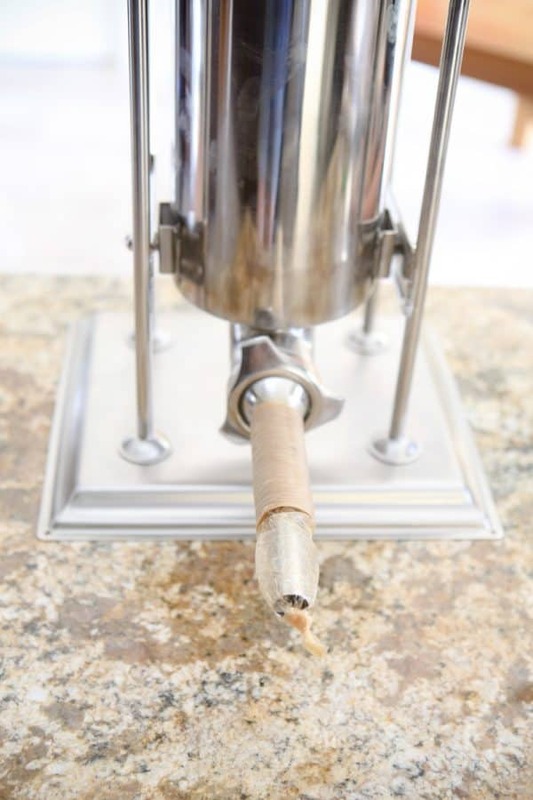 You can find lots of helpful videos on how to use this Big Bite® Sausage Stuffer and the other amazing products at LEM on their website here. 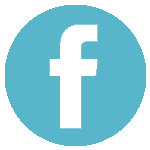 Find out more about LEM™ Products and shop for all their amazing products on their website here. 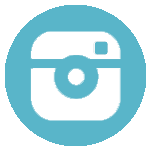 Be sure to stay up to date with LEM on Instagram, Pinterst, Youtube and Facebook. 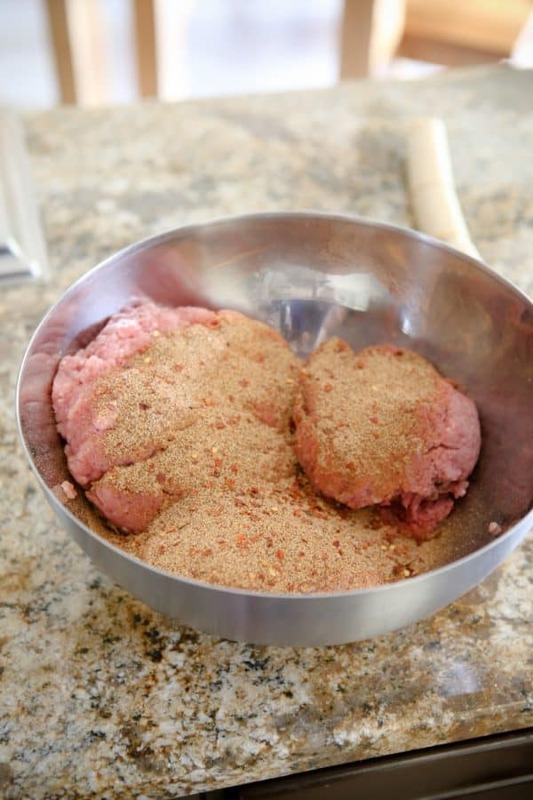 Combine ground meat and seasonings in large bowl. Add seasonings and mix well with hands until throughly combined. Add water and mix until well combined. Place in Big Bite® Sausage Stuffer and stuff sausage using edible sausage casings. Add links of sausage to a large skillet with about a cup of water. Turn heat to medium and cover with lid. Continue to cook sausages, turning occasionally until done and internal temperature is 160°. Let water evaporate and add a little oil if desired and brown sausages. Remove from pan. Add onions and green peppers to skillet. Sauce until tender crisp. Add tomatoes and beans. 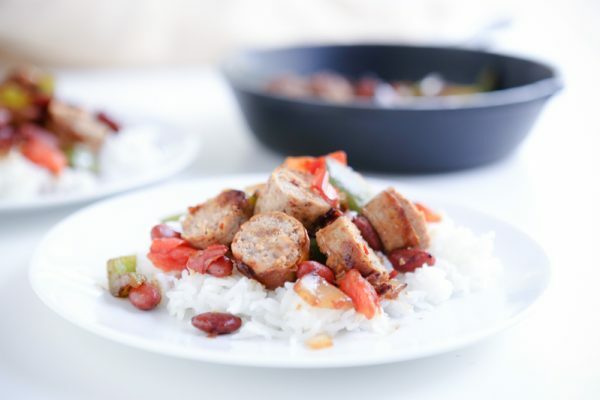 Slice sausage and add ti back to the skillet. Heat through and serve over rice. This looks incredible! I’d love to try this out!